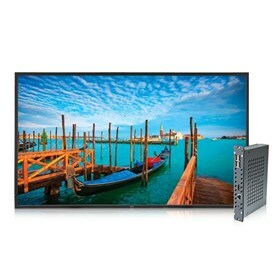 The NEC V652-DRD is a bundled solution that includes 65” edge-lit display and media player for digital signage. This display has 1920 x 1080 resolution that displays incredibly clear imagery. The LED backlighting technology reduces power consumption and allows for a slimmer cabinet depth. The display offers useful features such as RS-232, ethernet connectivity, and support for DDC/CI standard for external control, tilematrix for configuring a video wall, and text ticker function. The V652-DRD digital mediaplayer is powered by the Android 4.2.2 OS and 2GB dual-channel RAM. It features a built-in Wi-Fi adapter, SD card slot, support for wired LAN, 8GB of flash storage, and 2 USB ports. The built-in, low-profile 8W speakers are provided with display that enhances its sound quality. The NEC V652-DRD has many exciting features for users of all types. The NEC V652-DRD is sold as a Brand New Unopened Item.